Agra, India (The Taj Mahal City) is a city in the northern state of Uttar Pradesh, India. Its located at the banks of river Yamuna, 363 Kms west of the state capital of Lucknow and 200 Kms south from national capital of New Delhi. The City finds mention in the Epic Mahabharata where is was called Agrevana, or the border fo the forest. Legend ascreibes the founding of the city to Raja Badal Singh (around 1475), whose fort, Badalgarh, stood on or near the site of the present fort. However the 11th century Persian poet Mas’udSa’ d Salman writes of a desperate assault on the fortress of Agra, then held by the Shahi King Jayapala by Sultan Mahmud of Ghazni, Sultan Sikandar Lodi was the first to move his capital from Delhi to Agra in the year 1506. He died in 1517 and his son Ibrahim Lodi remained in power there for nine more years, finally being defeated at the Battle of Panipat 1526. It achieved fame as the capital of the Mughal emperors from 1526 to 1658 and maintains a major tourist city destination because of its many marvelous Mughal Era buildings such as Taj Mahal, Agra Fort and Fatehpur Sikri all three of which are selected as UNESCO WORLD HERITAGE SITES. Taj Mahal is one of the most famous buildings in the world, the mausoleum of Shah Jahan’s favorite wife, Mumta Mahal. Its is one of the New Seven wonders of the world, and one of three World Heritage Sites in Agra. Taj Mahal was built by the Mughal king Shah Jahan as the final resting place for his beloved wife, Mumtaz Mahal. Finished in marble, it is perhaps India’s most fascinating and beautiful monument. This perfectly symmetrical moumument took 22 years (1630-1652) of labour and 2000 workers, masons and jewellers to build and is set amidst landscaped gardens, Built by the persian architect, Ustad Isa, the Taj Mahal is on the bank of the Yamuna River. It can be observed from Agra fort from where Emperor Shah Jahan gazed at it, for the last eight years of his life, a prisoner of his son Aurangzed. It is an acknowledged masterpiece of symmetry. Verses of the Koran are inscribed on it and at the top of the gateare twenty two small domes. The Taj Mahal was built on a marble platform that stands above a sandstone one. The most elegant dome of the Taj Mahal has a diameter of 60 feet and rises to a height of 80 feet directly under this dome is the tomb of Mumtaz Mahal. Shah Jahan’s tomb was erected next to hers by his son Aurangzed. The interiors are decorated by fineinaly work. Incorporating semi percious stones. The Taj Mahal is open from 6:00 AM to 7:30 PM every day except Friday. Entry costs Rs 250 (plus levy of Rs 500) for foreigners and Rs 20 for Indians. Get there as early as possible to beat the crowds, and plan to visit the Taj at least two different times during the day (dusk and dawn are best) in order to experience the full effect of changing sunlight on the amazing building. It is also utterly stunning under a full moon. To buy tickets, you can go to the south gate, but this gate is 1 km far away of the entrance and the counter open at 8:00 AM. At the west and east gate, the counter open at 6:00 AM. 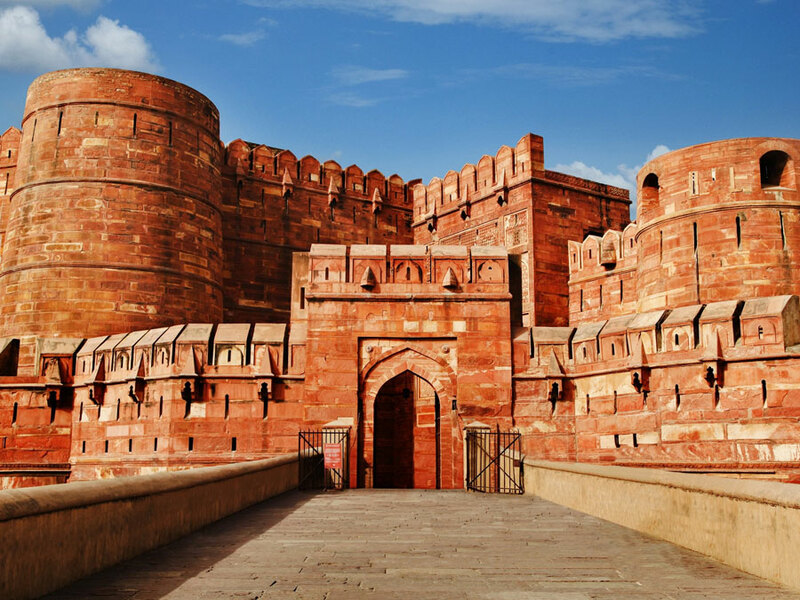 Agra fort is similar in layout to the Red Fort in Delhi, but considerably better preserved, as much of Delhi Fort was razed by the British after the Mutiny. As much as palace as a defensive structure, it is also constructed mainly from red sandstone. Agra Fort was commissioned by the great Mughal Emperor Akbar in 1565, and is another of Agra’s World Heritage Sites. A stone tablet at the gate of the Fort states that it had been built before 1000 but was later renovated by Akbar. The red sandstone fort was converted into a palace during Shah Jahan’s time, and reworked extensively with marble and pietra dura inlay. Notable buildings in the fort include the Pearl Mosque, the Diwan E Khas (halls of public and private audience), Jahangir’s Palace, Khās Mahal, Shish Mahal (mirrored palace), and theMusamman Burj. You can get to the fort by Rickshaw from Taj Mahal for around 25-30Rs. Entry to the fort is Rs 250 (plus levy of 50 Rupees if you have not already paid the 500Rs fee for Taj Mahal). The oldest Mughal garden in India, the Ram Bagh was built by the Emperor Babar in 1528 on the bank of the Yamuna. It lies about 2.34 km north of the Taj Mahal. The pavilions in this garden are designed so that the wind from the Yamuna, combined with the greenery, keeps them cool even during the peak of summer. The original name of the gardens was Aram Bagh, or ‘Garden of Relaxation’, and this was where the Mughal emperor Babar used to spend his leisure time and where he eventually died. His body was kept here for sometime before sending it to Kabul. The mosque at Sikri was the first structure to be built in 1571. The exterior is modest but the interior carries the most gorgeous ornamentation in the floral arabesques and ingenious geometrical patterns in brown…. The Mughal Emperor Akbar built Fatehpūr Sikrī about 35 km from Agra, and moved his capital there. Later abandoned, the site displays a number of buildings of significant historical importance. A World Heritage Sites. it is often visited by tourists. The name of the place came about after the Mughal Emperor Babar defeated Rana Sanga in a battle at a place called Sikri (about 40 km from Agra). Then the Mughal Emperor Akbar wanted to make Fatehpūr Sikrī his head quarters, so he built a majestic fort; due to shortage of water, however, he had to ultimately move his headquarters to Agra Fort. Sikandra, the last resting place of the Mughal Emperor Akbar the Great, is on the Delhi-Agra Highway, only 13 kilometres from the Agra Fort. Akbar’s tomb reflects the completeness of his personality. The vast, beautifully carved, red-ochre sandstone tomb with deers, rabbits and langurs is set amidst a lush garden. Akbar himself planned his own tomb and selected a suitable site for it. To construct a tomb in one’s lifetime was a Turkic custom which the Mughals followed religiously. Akbar’s son Jahangir completed construction of this pyramidal tomb in 1613. The 99 names of Allah have been inscribed on the tomb. Agra Railway station is well conneted with Delhi, All Major states & cities of India.